The OmniFlex starts with a standard 4U / 19-inch rackmount chassis that can accommodate up to eight single- or multi-channel fiber optic modules, providing up to 64 optical channels per chassis. You can easily add modules yourself – just remove the blank panel at the location where you want to add the new module and slide it into the chassis. Fasten the module in place and the back panel connector will do the rest. The new module will automatically be recognized by the OmniLink™ software. 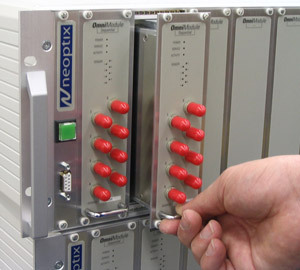 The OmniFlex System allows using various types of modules in the same chassis. These modules, called OmniModules, can easily be swapped between chassis to match the needs of specific projects in your laboratory or testing facility. Multiple chassis can be cascaded together to form an array of up to 512 optical channels. The system can also be upgraded to a maximum of 512 channels. 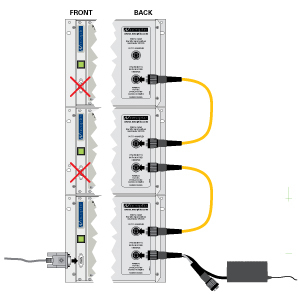 OmniModules are available with one, two and four optical channels providing direct measurement at a rate of 6 Hz per channel. 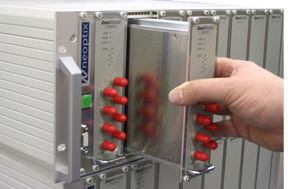 OmniModules are also available with 4 or 8 channels that are multiplexed at a rate of 250 ms between channels. The OmniFlex is controlled by a PC through a USB serial communication port using the Neoptix OmniLink™ software included with the system. This software features direct data logging and saving of data to a Microsoft® Excel™ spreadsheet. Thanks to its upgradeable architecture, the OmniFlex can be adapted to match your specific communication protocol. Neoptix has also developped a LabView™ driver for the Omniflex, allowing an easy and quick product deployment into your lab or control room. The OmniFlex System features a standard 19-inch rackmount chassis with integrated brackets and handles. The OmniFlex can be delivered already latched in an ATA-300 transport case. This option allows for the system to be moved securely between different locations. The case has spare storage for the temperature probes and other accessories. The Neoptix™ OmniFlex System is specifically designed to meet industrial requirements: extended intervals between servicing, low maintenance, rugged components and the ability to withstand the harshest conditions. The systems is approved for in-flight tests, which are the most stringent standards regarding shocks, vibrations, humidity and variations to pressure and temperature. All components have been specifically selected for long term performance, including the light source that has an MTBF superior to 300 years. Moreover, compared to other technologies available on the market, like fluorescent decay, Neoptix sensors, based on solid state semiconductor, do not fade over time, allowing constant and absolute temperature measurements. The system is based on the proven GaAs technology. An original algorithm is used to analyze the signal and provide repeatable and reproducible measurements. Our fiber-optic probes are made only with dielectric materials and are compatible to energy fields. They are also transparent to NMR. Moreover, the Neoptix™ temperature probes are interchangeable and no calibration or inconvenient gage factors are required when exchanging sensors. 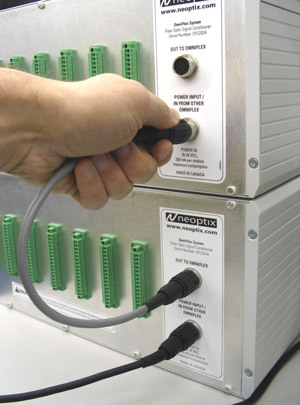 The OmniFlex accepts any of Neoptix’ fiber optic temperature probes and transducers, starting from our T1 general-use sensors to the T2 probes for oil-filled transformers. LabView name and LabView logos are trademarks of National Instruments Corporation. Portable transport case for the OmniFlexSystem, ATA-300 compliant, two drawers for storing sensors and extensions. Also acts has rackmount enclosure.